The Lynx! One of the most difficult animals to get near in the swedish wilderness. 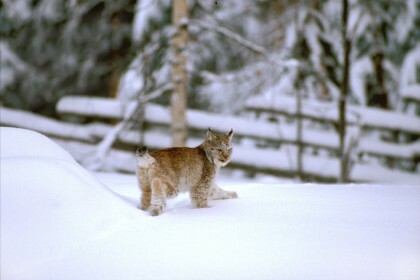 In the surroundings of the village Valsjöbyn in the north of the county Jämtland lives the notorius old lynx male, Thor. A huge cat that have elusive the villagers and the hunters for years. With snow shoes or back country skis we get out in the rough terrain to track lynx. Don’t get disappointed if we found other tracks from wolverine, elk and other game. It’s just a bonus. A complete tracking event with guides and land transport.